The poster is from this photoshop contest at Something Awful (warning--lots of vulgarity, might be NSFW). And I totally stole this post from Katrina Gulliver. A nice article from historian John Ferling at Smithsonian Magazine--Myths of the American Revolution: "We think we know the Revolutionary War. 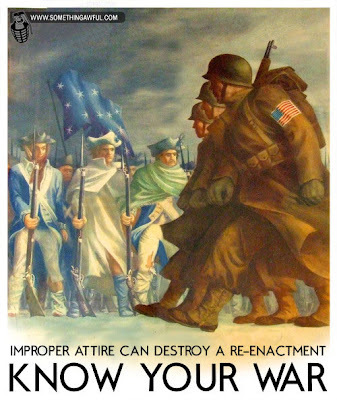 After all, the American Revolution and the war that accompanied it not only determined the nation we would become but also continue to define who we are. The Declaration of Independence, the Midnight Ride, Valley Forge—the whole glorious chronicle of the colonists’ rebellion against tyranny is in the American DNA. Often it is the Revolution that is a child’s first encounter with history. Yet much of what we know is not entirely true. Perhaps more than any defining moment in American history, the War of Independence is swathed in beliefs not borne out by the facts. Here, in order to form a more perfect understanding, the most significant myths of the Revolutionary War are reassessed." Among Ferling's points--Saratoga was not that decisive, Washington was not a particularly good general, and the war could easily have gone the other way. A nice review of the war and a good introductory reading for high school or college courses. For other good popular history articles at Smithsonian, browse the History and Archeology section. Another reason to study public history in this piece from Inside Higher Ed: Disappearing Jobs: "The Modern Language Association's annual forecast on job listings, being released today, predicts that positions in English language and literature will drop 35 percent from last year, while positions in languages other than English are expected to fall 39 percent this year. Given that both categories saw decreases last year, the two-year decline in available positions is 51 percent in English and 55 percent in foreign languages." The article goes on to note that "the declines in each of the last two years are the largest ever recorded by the MLA, since it started tracking the trends in the association's Job Information List 35 years ago. The list has also never had fewer notices of openings." Though the MLA is about English, the academic history job market tracks quite closely with the broader humanities market. And it should be remembered that these markets were terrible before the current economic crisis, with literally dozens and occasionally hundreds of qualified applicants for every opening. Now the market is at least twice as bad as that. And there is no reason to expect it ever to improve very much. The end of mandatory retirement means that many teach on much longer than in previous generations (in part to keep the health insurance). Those that do retire are more often replaced by adjuncts and other contingent faculty than by tenure track positions. And the number of undergraduate history majors continues to decline. As a professor it is flattering when a student wants to follow in your footsteps. But that path has so narrowed in recent decades that it is effectively closed. Those of us who teach in the humanities have an obligation to firmly tell our charges to forget it. 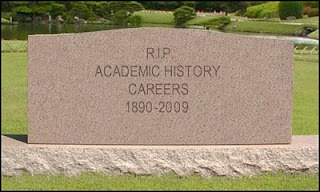 We need to steer them towards alternate careers, such as public history. Jon Sutton Lutz, ed., Myth & Memory: Stories of Indigenous-European Contact (Vancouver: University of British Columbia Press, 2007) 236 pp. 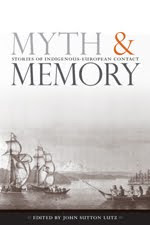 In this anthology of articles about first contacts between native and European peoples, editor Jon Lutz shares a description by one of Captain Cook’s officers of an evening encounter on the Northwest coast. 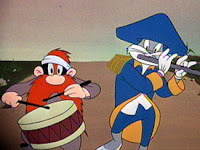 One Indian man sang “a few words in tune” accompanied by the beating of canoe paddles, “after which they all joined in a song that was by no means unpleasant to the Ear.” The English answered with a “Fife and drum” tune. “Not to be outdone in politeness” the native sang another song, which the English followed with a song on the French horn. The approach is frequently rewarding. Patrick Moore examines the use of humor in contact narratives of the Canadian Kaska tribe to make the larger point that native groups often had different story-telling traditions with different purposes, traditions that need to be understood by scholars using the stories. In an important chapter, I.S. MacLaren explores Paul Kane’s writings on Chinook Indians. He shows how the published texts that many of us have relied upon as primary sources were heavily adapted, altered and even invented by a variety of editors working sometimes from Kane’s field notes, but more often from other published sources on the Chinook and perhaps from their own imaginations. This linguistic turn can also take the reader down some dark alleys before we emerge into the light of day. In an otherwise fascinating chapter about “narrativity and the lost colony of Roanoke,” Michael Harkin takes us through “topoi,” “iterations and reiterations,” “the mode of theatricality,” the “erotics” and “politics” of representation, “poetics of ambiguity,” “epitomizing events,” and, most unfortunately, “(ab)originality” as we take a learned tour of four centuries of writings about Roanoke. The combination of Harkin’s postmodern rigor and his modest conclusion—that it is exactly the racial and other paradoxes of the story that invites constant reinterpretation—leaves the reader feeling as if he had listened to a shaggy dog story at the MLA. 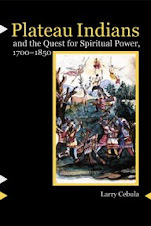 Myth and Memory is an important collection for anyone studying first encounters, native peoples or colonialism. It is hoped that many of the essays here will grow into monographs on their topics. Myth and Memory may be purchased here. This is fun--watch this classic scene from Good Will Hunting, in which Matt Damon schools a Harvard graduate student, then peruse the customer reviews of a book mentioned in the scene: Daniel Vickers' Farmers & Fishermen: Two Centuries of Work in Essex County, Massachusetts, 1630-1850. The explosion of digital technologies, falling prices for equipment, and the development of an online audience interested in history has allowed everyone to get into the business of public history. Anyone with a netbook and perhaps a Flip video camera can produce original history content, put it online via Blogger or Facebook or dozens of other free platforms, and publicize their wares with Twitter or listservs or whatever. But what good does this do us if they get their history wrong? Exhibit A: This podcast on the Whitman Tragedy by what appears to be a one-man outfit, US History Travelcast. I very much admire what Jeff Linder, the author of this podcast series, is trying to do. His fledgling site has podcasts on topics as diverse as Plymouth Rock, Seth Bullock (of Deadwood fame), and a 1959 prison riot in Montana. Many of the topics are drawn from Linder's travels and his website includes photographs of many of the featured locations. Unfortunately the content, at least for this episode, is pretty weak. 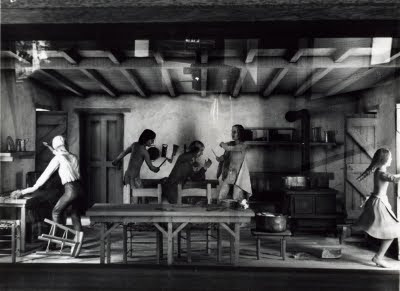 The problem with Linder's podcast is that he tells the story of the Whitman Mission exactly the way historians of a hundred years ago told the story--of saintly missionaries who headed west and were murdered by superstitious (and faceless) Indians who did not know any better. Linder begins his story with the missionaries at their homes in the northeast, rather than with the Cayuse and Walla Walla peoples along the Columbia. He carefully recites the the full names of each missionary, while mentioning no native person by name until he drops the names of two of the individuals who killed the Whitmans. Indeed the first mention of Indians at all is when he says that the Whitman's joined a fur brigade for safety against "raiding bands of Indians." He repeats the idea that part of the importance of the missionaries is that their party included the "first white women over the Rockies," which is one of those racialized "firsts" that makes modern historians cringe. The important back story to the mission--the fur trade, the native journey to Saint Louis, the religious changes before the Whitman's arrival--are absent. Linder has Lewis and Clark "discovering" the Columbia River, which would have been news to the American and English sea captains who had sailed up its mouth a generation earlier, let alone the native peoples who had lived there for a hundred generations. He repeats the old myth that a wagon train of immigrants gave measles to the Cayuse, an idea disproven by anthropologist Robert Boyd a decade ago. And Linder has the mixed bloods Joe Lewis and Nicolas Finley as instigators of the killings--a popular 19th century theory but one not widely accepted today. In his introductory episode Linder explains that he was never interested in history until a recent visit to Washington D.C. where history really came alive to him. "I am not a historian," Linder explains, "I don't have a degree in history." And yet he does have a podcast about history, and his lack of historical training undermines his efforts. I have spent too many words picking on this poor podcaster who wanted nothing more than to share his love of history. Let me turn to the real culprit here--the historical profession, which has been slow to adopt new technologies and has left the digital path open to well-meaning but untrained amateurs. Most of us could easily create a podcast and some blog posts on some of our favorite topics. It isn't that hard. But we fail to embrace the new opportunities to reach a public that is hungry for history, and others fill the vacuum. Don't ever create an extensive list of hyperlinks on your website. Just don't do it. It is so easy to get caught up in the excitement of cataloguing all the wonderful websites you find on your topic. Then you create your own website with a links page to these resources. And then--it falls apart. URLs change, websites go down, what was good becomes bad or redundant in the light of other new sites, and you have a mess on your hands. No problem. Lets try a different link. The East Benton County Historical Society? "Oops! This link appears to be broken." The Echoes of the Past Archive sounds interesting. "This domain is for sale. Please contact info@echoesarchive.com for more information." 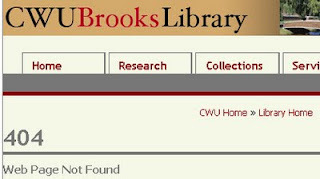 Nevermind, let's try my own Eastern Washington University--no, another 404 page. Of the first 15 links for Washington State, 11 are broken. I do not mean to slam on the fine people at the University of Idaho, who obviously put a great deal of effort into creating this resource. No doubt they meant to maintain it, and no doubt more pressing matters have directed their attention elsewhere. This is just what happens to such endeavors. So kids, never create extensive links pages. Or if you must, make them a wiki and leave a note asking users to fix anything they find that is broken. I don't agree with him but I do love the man. And Renee and I are going to see him on Saturday!